Plaquenil (hydroxycholoroquine) is a medication used to treat lupus, rheumatoid arthritis and other inflammatory and dermatologic conditions. It is very effective and the risk of damage to the eye is very low the first five years if the patient is receiving the recommended dose and does not have special risk factors like kidney damage. However, the risk increases the longer the patient is on the medication and with higher doses. Plaquenil can damage the central vision and cause permanent vision loss if not detected early. In the early stages the patient may not notice any change in the vision at all! This is why it is important to be examined routinely if the patient is on long term plaquenil therapy. In the later stages, the patient may notice blurred vision, loss of central vision, difficulty reading, change in color vision or change in contrast sensitivity. In the later stages, vision loss may progress even after stopping the medication. If the patient does not have any special risk factors, annual screening is recommended after 5 years. The goal of monitoring patients on plaquenil is to detect any damage to the retina in the earliest stages. In the early stages, the damage to the eye usually stops after stopping the medication. Since plaquenil is such an effective and relatively low cost medication, the recommendation to stop plaquenil should not be made lightly. Damage to the eye from plaquenil can be very subtle in the early stages and can be difficult to detect. Melles RB, Marmor MF. 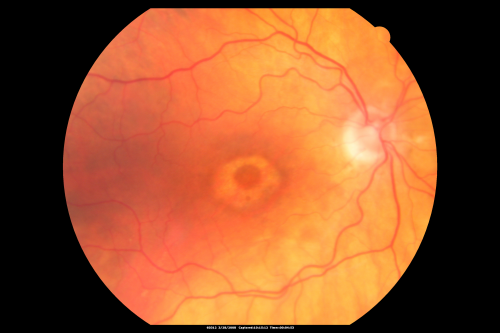 The risk of toxic retinopathy in patients on long-term hydroxychloroquine therapy. JAMA Ophthalmol 2014;132:1453–60.